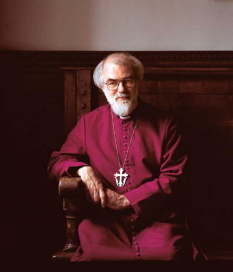 Rowan Williams, Archbishop of Canterbury, attended the inaugural mass for Benedict XVI (source of the photograph: Archbishop’s webiste, http://www.archbishopofcanterbury.org). 4 May 2005 — Father Peter Toon is a strict traditionalist in all things liturgical, which is fitting since he leads the Society for the Preservation of the Book of Common Prayer. “Of course ‘Credo‘ means ‘I believe.’ … And it’s the same thing in the Greek Orthodox liturgy, because ‘Pisteuo‘ can only mean ‘I believe,’ ” he said. These liturgical wars have been going on for decades and the combatants are always seeking allies at other altars. This is how Toon began corresponding with the leader of the Vatican’s influential Congregation for the Doctrine of the Faith. This was Cardinal Joseph Ratzinger of Germany — now Pope Benedict XVI. The cardinal agreed that it wasn’t heresy to translate “Credo” as “we believe.” But Ratzinger also said that this error would eventually need to be corrected in the Roman Missal, said Toon. They had a friendly series of exchanges. But journalists and photographers paid close attention to the precise details of this rite of reception. It is easy to make too much of these contacts, said Toon. After all, Benedict XVI supports traditional Anglicans in the Third World and elsewhere on many issues, but he disagrees with some of their compromises — such as a softened stance against divorce.